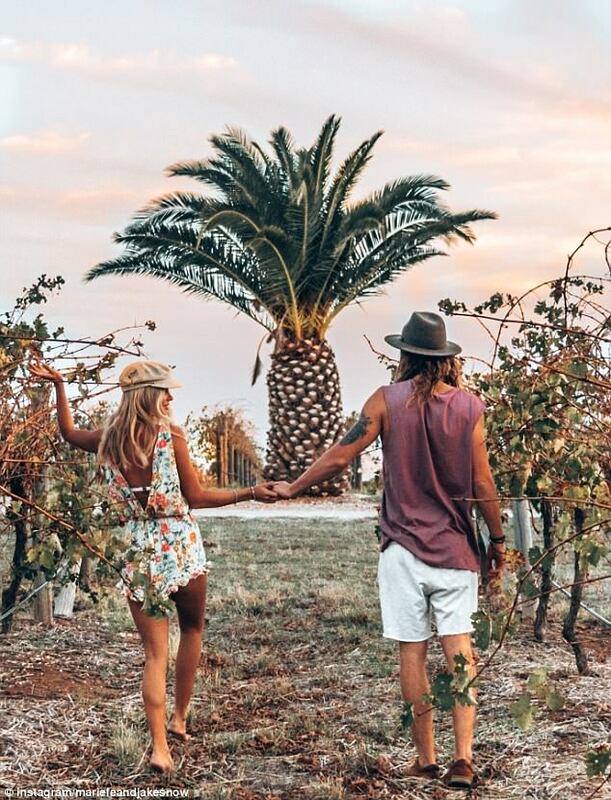 There is no shortage of 'Instagrammable couples' on Instagram sharing their jetsetting lifestyles to masses of followers - and earning money as they do so. But Australian Jake Snow, 26, and his German girlfriend Marie Fe, 28, didn't set out to be social media famous - for them it's always been about love. 'Back in 2016 when we first met we were from opposite sides of the world and had opposite ideas of what love was,' Jake told FEMAIL. 'We had no idea how it would all turn out back then but we both felt something special and we decided that taking a chance at true love was worth the risk. 'We gave up quite literally everything, we spent our life savings, we quit our jobs, sold our cars and Marie also quit her masters degree she had already paid a $3000 deposit for. 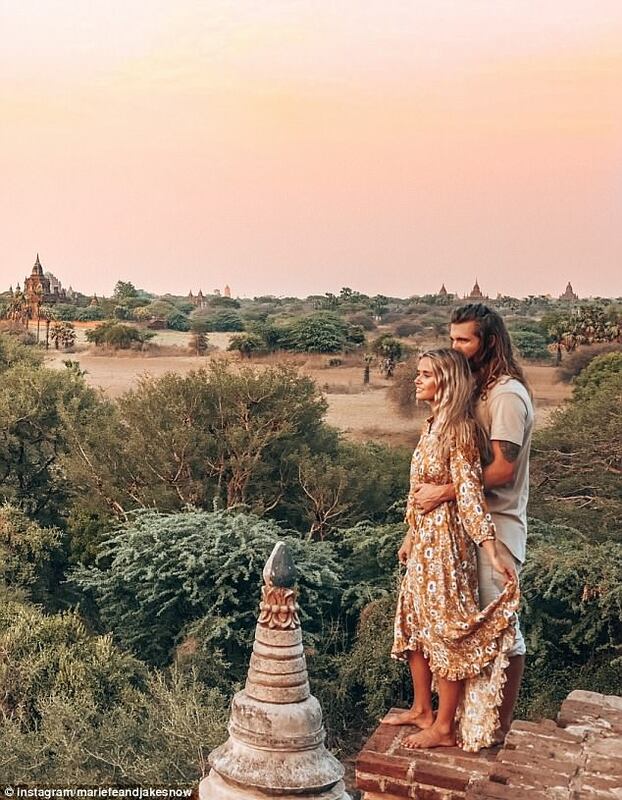 They never made a conscious decision to start an Instagram account, but more than 110,000 people are following along on their journey around the globe. But that doesn't mean their life is always as glamorous as their pictures make it seem. 'We aren't the couple that gave up the 9-5 and just rode off into the sunset, we still have normal jobs and we make it known that this life we are living takes a lot of hard work,' Jake explained. Just do it - Its one thing to think it, and another to do it. Its so easy to over complicate things and worry so much about the finer details that you lose the emotion you had when you first thought of travelling. The fear or the hesitation we all have is a natural response to exposing ourselves to something uncomfortable. It would be easier to stay home, but it wouldn't be as fulfilling and you wouldn't experience so much personal growth. So when you feel that hesitation, realise its a good thing, and then make your move. Travel Lite - No matter how hard we try to remember to look after our gear, on every trip we lose or break something of value. When you are constantly on the move its so easy to forget things. We have realised that having less is so much better. We don't stress as much and our minds are more at ease. Plan ahead but don't expect everything to work out - Travel is a beautiful thing, but not the most reliable in terms of expectations. Wherever you go, travel with an open mind and be ready to jump at opportunities. 'Instagram in itself is a highlight reel. Amongst the glamour and the jet-setting there are plenty of uncomfortable nights, hours spent on laptops, cheap meals, and stressful travel days. 'When it comes to the topic of how we afford so much travel it is easy to assume that we come from family money or that we get all-expenses-paid trips to advertise everything we do. It is a lot harder to accept the truth. The truth is, anybody can do what we do. 'The main reason we are able to afford this lifestyle is that we choose it. We are not focused on owning material possessions, rather we spend our money on experiences. 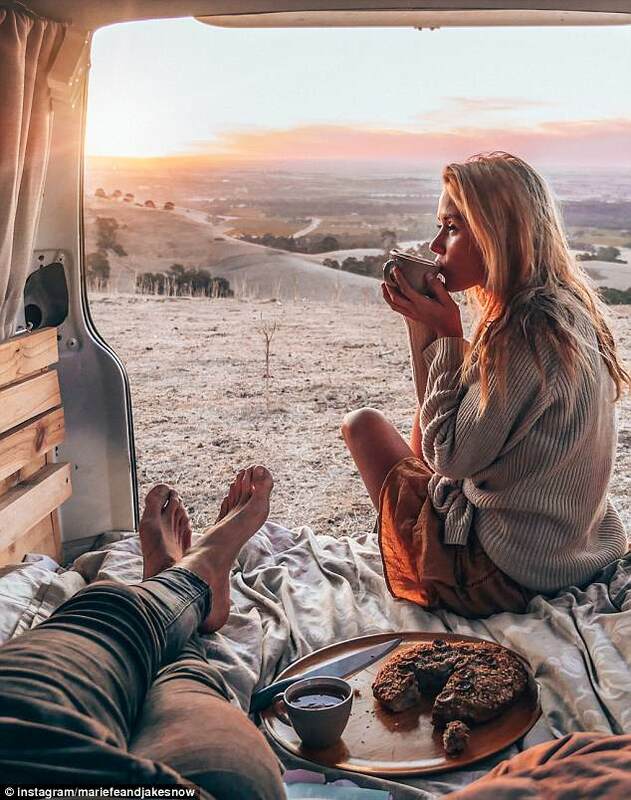 'Specifically, in order to make enough money to pursue our passions, hone in on our craft and travel the world we work a seasonal job in Australia for 3-4 months a year, pulling 12 hour night shifts for six days a week. And while their budget plan is clear, many of their fans can't quite grasp how they're taking such incredible photos. Particularly when they're both in the photo. 'We get asked all the time "who takes your photo?". Most people think we travel around with a third wheel professional photographer that follows us wherever we go. This is not the case,' Jake admitted. 'Sometimes we wish we did have a third person because that would make our lives a lot easier, but wheres the fun in that? The truth is we take a tripod wherever we go. Having two of us make it really easy to frame the shot. 'We have to get super creative most of the time and place the tripod in places it really shouldn't be (in water, hanging on cliffs, on rooftops). You can follow their adventure here.